Solving the problem in only one of these areas can result in the problem moving to other areas. 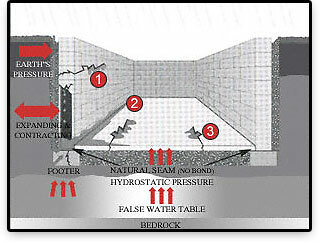 This page shows the water damage warning signs that you should be looking for. Click the picture that corresponds to your problem to read more information. An unpainted block will turn dark gray when it’s wet. A painted wall will show discoloration, or a darkening of the paint. 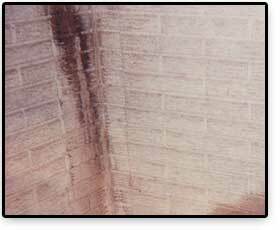 A poured wall might show discoloration. In any case, there might be white or dark outlines surrounding the area, which means that either leaked before, or substantial moisture has come through in that area. 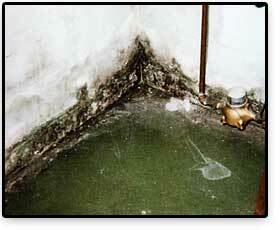 Mold and mildew are living, breathing organisms that grow and multiply anywhere there is excessive moisture. 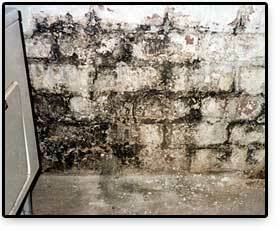 For those of us exploring our basements, mold and mildew can grow in the walls, carpeting, furniture, or anywhere else it can find a food source. It was the wrong paint. The surface wasn’t properly prepared. 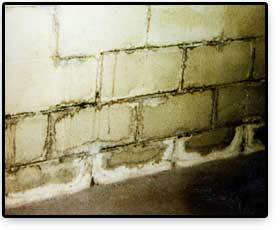 There is dampness or moisture in the wall you are trying to paint. Paint will not stick to damp surfaces. It’ll discolor, or peel off much sooner than it should. Metal is susceptible to rusting when there is excessive moisture. 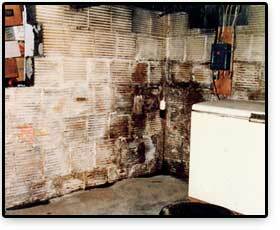 The rust may begin on fuse boxes, washers or dryers, or other metal appliances due to dampness. Once it happens, you have to completely remove the rust and repaint as soon as possible, and then look for the cause of the moisture. If not, the rust will reappear. 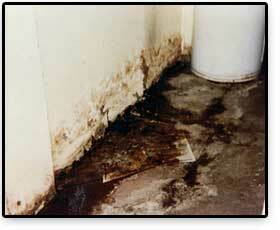 Musty odors are merely the result of the decay process associated with mold, mildew and dry rot. It is the odor given off by the decaying material. Once you smell it, look for the source, and try cleaning any item that has the smell. If it returns, you’ll need to replace it. This can appear as a brownish-black fungus growth on walls, clothing and other surfaces; it typically grows on wood surfaces. Keep in mind that dryrot is a byproduct of the decaying process – you’ll need to not only replace whatever is damaged, but also find and cure the cause of the dry rot forming in the first place. Cracks can come in a variety of shapes, sizes and directions. For example, you may see step-cracks on the wall. You might find vertical cracks, or horizontal cracks. 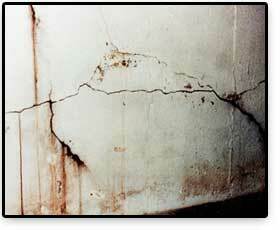 In any of these cases, something is causing this to happen – cracks don’t usually appear naturally. It could be from settling, pressure on the walls or under the floor, or any number of other causes. Wood is porous. It absorbs moisture. Warped paneling is a sign that excessive moisture exists, and you need to find out why. The good news: if you find the source, you can fix it so that your new paneling won’t warp. The bad news: you can’t repair warped paneling. You have to replace it. Concrete is made up of limestone, clay and mortar, and aggregate (stone). That white outline or spot you see is the calcium in the block leaching out. 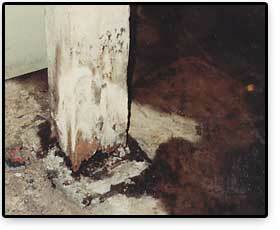 It’s an indication of water, excessive moisture, and is something you should pay attention to. It’s called efflorescence.